The Reliable Scientific 55 Lab Rocker provides uses with consistent rocking with adjustable speed and tilt to get you ideal conditions and agitation. This rocking shaker is ideal for applications in staining and destaining gels, immunoblotting, hybridization, tissue culture and more. This two-tier platform rocker has an adjustable tilt of between 0-20°, on an 11 x 14” surface with nonskid rubber mats that are removable for cleaning. This rocking laboratory shaker has a speed range of 4-160 RPM, letting users achieve gentle wave like motions, or if they need faster uniform mixing. Speed is controlled and monitored constantly, ensuring the set speed is maintained. 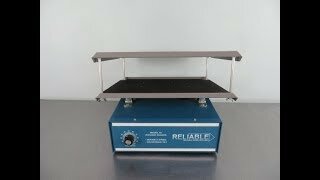 The Reliable Scientific 55 Lab Rocker can be used in a cold room, and will tolerate temperatures 0º to 65º C, for a low-cost hybridization solution. These Reliable Scientific 55 Rocking Shakers have been fully inspected and are performing without issue. All of our lab equipment comes backed with our standard warranty. Should you have any questions, please don't hesitate to contact us.